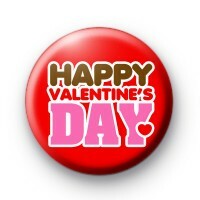 This is a bold red (the colour of love) 1-inch button badge with the message, Happy Valentines Day written in a decorative bubble font. It's pretty and romantic so it's it the ideal badge to give to your loved one this year. Its fun and cute and a lovely small handmade token of your love. Make sure you order it in time for February 14th.